Buying a telescope is an important first step towards a new level of appreciation for the night sky, and the wonders found within it. I was once in this position myself, and I found the number of telescope options overwhelming. From my experience, the best telescope for beginners is one that guides you through the process of learning the night sky in a straightforward and gratifying way. It’s easy to get swept away with an optical instrument that is likely too complex for a beginner to learn early on. It is best to start with visual astronomy before adding a camera to attempt astrophotography. For this reason, I strongly recommend an 8″ Dobsonian Reflector like the Aperture AD8 for beginners. This telescope will allow you to observe the night sky through the eyepiece, and enjoy a live experience of the stars and planets above. Not only is it a humbling experience, but it’s also the best way to learn the night sky. By ‘star hopping’ to your intended deep sky target, you’ll learn the names of the brightest stars, the constellations, and watch the sky change throughout the seasons. A manual telescope, like the Dobsonian reflector I recommend, will help you connect with our Universe on a deeper level than any computerized telescope ever could. The moment you find a glowing nebula through the eyepiece, while scanning the sky, will take your breath away. Because you are moving the telescope by hand, you have complete control. 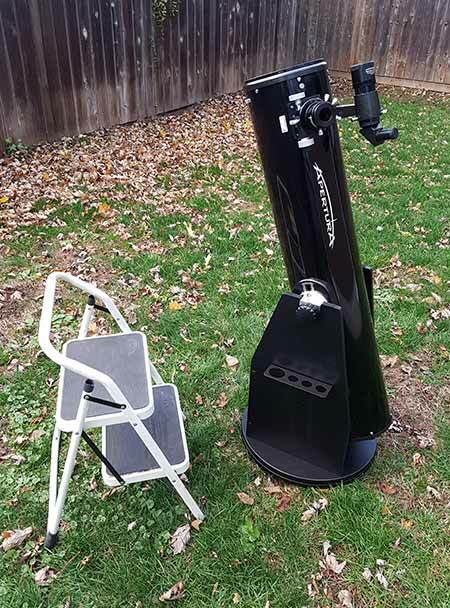 Forget about the wobbly department store refractors you used as a child, a Dobsonian reflector is the top choice of amateur astronomers looking for the ultimate observing experience. 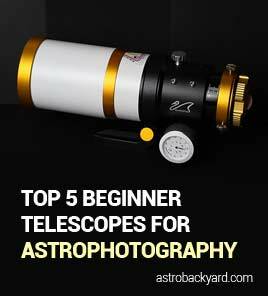 On this page, I’ll go over some of the options you have when it comes to buying your first telescope. I’ll also share my personal and honest advice for the absolute best telescope for beginners. I realize that most of the people that visit my website are here because of the information I share about astrophotography. However, before I dove into the complex and rewarding world of astrophotography, I observed the night sky with my eyes. Looking for astrophotography telescopes? See my top 5 choices. The instrument I recommend for beginners is the type of telescope that propelled my interest in astronomy into a life-altering addiction (now known as AstroBackyard). It fostered my curiosity at a manageable pace, and kept me coming back for more. Whether it was viewing the planet Jupiter using high magnification, or seeing The Pleiades star cluster for the very first time, that first summer under the stars with my telescope was a pivotal stage of my life. 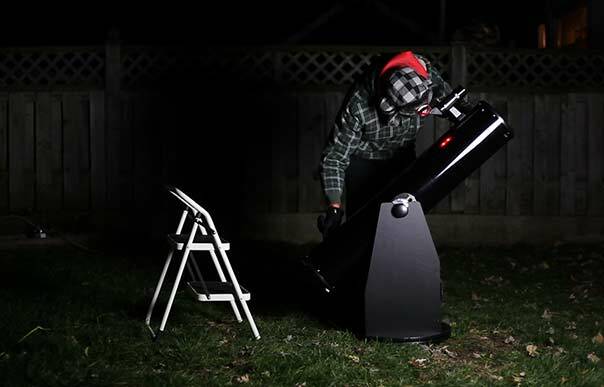 The most important aspect of choosing a telescope is to ensure that you buy an instrument that nurtures your desire to observe and enjoy the night sky. A poor user experience may hinder your enjoyment of the hobby overall, so be wary of the cheap telescopes that deliver underwhelming results. For transparency, the telescope I recommend for beginners (The Apertura AD8) costs roughly $450 USD. You may find a telescope that’s able to fulfill your needs of visual astronomy for less, but keep this figure in mind as a benchmark. 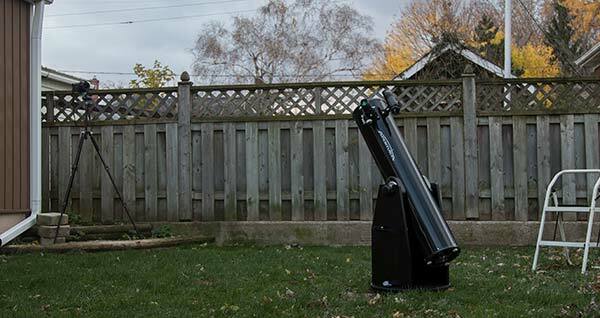 A telescope like this can deliver impressive views of the night sky from your own backyard. Unlike some of the smaller refractors I’ve discussed on this website, this telescope excels at viewing both planets and deep sky objects such as galaxies. I have been immersed in the world of amateur astronomy for so long, I often forget to slow down when rhyming off the technical terms associated with telescopes. The following list of telescope terms must be comprehended to understand why I think a Dobsonian reflector is the best choice for beginners. The telescope specifications listed above will give you an idea of what to expect with the instrument. Each type of telescopes will excel in certain areas, and not others. However, I think you will find that an 8-inch Dobsonian reflector packs an impressive punch in the most critical areas of a beginner telescope. 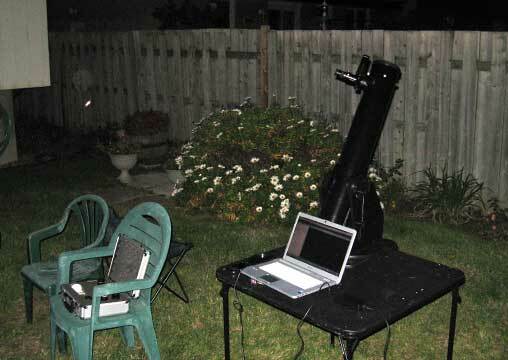 A poor telescope viewing experience early on can have a negative affect on ones perception of amateur astronomy. 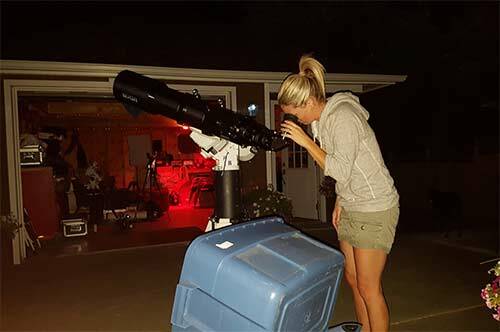 My goal is to make sure as many people start out their astronomy journey right; with a telescope that catapults their interest in the night sky to new heights. The enjoyment I experience observing the night sky and sharing it with others has changed my life. Astronomy has given me to another level of appreciation for the Universe and our place within it. A telescope can open this window. Luckily, there are more quality telescopes available than ever. Essentially, it will all come down to your budget, expectations, and needs. A telescope’s ability to collect starlight (aperture and f-ratio) is one of the most important aspects to consider when making your decision. A Dobsonian reflector offers the largest aperture per inch of any type of telescope. This is why you see so many giant Dobsonian reflector telescopes (some with primary mirrors as big as 36″) at astronomy star parties. I remember when I searched the internet for the “best telescope for beginners” back in 2010. There was a sea of information and technical specifications, most of which went right over my head. Luckily, I ended up making an excellent choice and had I not bought that 4.5″ Dobsonian to start, who knows if I would have developed the passion for astronomy I have today. A Dobsonian telescope is a Newtonian Reflector design, that includes a large primary mirror at the end of its optical tube. The large primary mirror reflects the image of your object in space to a secondary mirror, and into the telescope eyepiece. The result is an unforgettable real-time view of the wonders above our heads in the sky. If this is your first telescope, it’s important to first decide where your primary interests lie before making a final decision. Do you want to use the telescope visually, or to take pictures? I’d be willing to bet that the vast majority of newcomers to this hobby are quite interested in doing BOTH! My thought process about this subject was, “these views are amazing, I need to show somebody!” But the truth is, there is nothing like seeing the ‘real thing’ through a telescope visually. I dare you to invoke the same emotion you get by viewing Saturn under clear viewing conditions and a high-powered eyepiece, from a photograph. The truth is, I appreciate the wonders of our night sky on another level when viewing them in real-time through the eyepiece. Astrophotography is just another creative outlet for me to share my interests with others. Before you invest a lot of money in an expensive astrophotography telescope and a “go-to” tracking mount, I would make sure that you are ready to experience all aspects of viewing the night sky outside. This means setting up and traveling with your equipment, aligning and tuning the optics, and understanding how the telescope works. Not to mention, spending time outside in the dark for an extended period of time. If you have done your homework, buying your first telescope will be an enjoyable experience with the added comfort of knowing that you made the right choice for your needs. A telescope you feel comfortable using will get the most use. There are so many exciting things to observe in the night sky using a telescope. Beginners often wonder what is possible to see using a basic telescope through the eyepiece. Solar system subjects such as the moon and planets are often the most rewarding targets to observe through a new telescope. The planet Jupiter was one of the very first things I found using my Dobsonian reflector many years ago, and I remember the intense feeling of accomplishment and amazement. Here is a list of satisfying targets to observe using a beginner level telescope such as a Dobsonian reflector. I have organized the items into two lists, solar system objects, and deep sky objects. I have numbered the targets from best (most gratifying to least). Saturn is perhaps the most incredible sight to see through a telescope, but I have placed it further down the list simply due to size. Jupiter appears larger and will reveal surface detail and its four largest moons using amateur equipment. It is possible to find all seven planets using your telescope, but Uranus, Neptune and Mercury can be difficult to identify and observe. This list is very subjective, of course. There are many more amazing deep sky objects to observe including the Beehive cluster, the Ring Nebula, and many more. It’s up to you to find and enjoy these amazing sights through your first telescope. It turns out, my list is strikingly similar to this one from astronomysource.com. This further validates my list as objects that are well enjoyed by amateur astronomy enthusiasts around the world. Remember, don’t expect to see objects as you do in an astrophotography image! Through a telescope eyepiece, the objects will appear much dimmer and without color. Buying your first telescope can stir up a lot of excitement. You may get “aperture fever” and convince yourself that only an extra large 16″ Dobsonian telescope will do. It’s time to take a step back and understand that a telescope that is very large will take longer to set up, be heavier to carry, and cost a lot more money. You need to work your way up to that big light bucket. I would suggest you start by enjoying visual astronomy through a simple to use, and well-built telescope. This way you can learn the night sky on your own, casually experience the joys of stargazing, and spending time outside at night. It is one thing to sit in your comfy computer chair during the day and order a fancy telescope with lots of advanced features, and it is another to actually (and comfortably) use those features in the dark after midnight. Set a budget for yourself that won’t break the bank. Your first telescope should be of good quality, but you don’t need a top of the line model right away. Make sure to account for extra expenses that come along with the purchase, such as eyepieces and filters. A realistic budget for a quality telescope that will last for years is about $300-400+. You may find cheaper options available online, but I wouldn’t recommend cutting corners on the budget when looking to purchase an optical instrument such as an astronomical telescope. The good news is, the telescope I recommend for beginners a little further down the post is not much more than that! Telescopes come in many different optical formats, such as; reflectors, refractors, and compound telescopes. Each type of telescope has its own strengths and weaknesses. Although I personally favor refractors from an astrophotography perspective, they may not be an ideal choice for a beginner. Newtonian reflectors offer a much larger aperture at a lower price point. The telescope’s main light collecting element is known as the objective. In Newtonian reflectors this is a mirror, and in a refractor this is an objective lens. A larger objective means more detail and the ability to reveal dimmer targets. 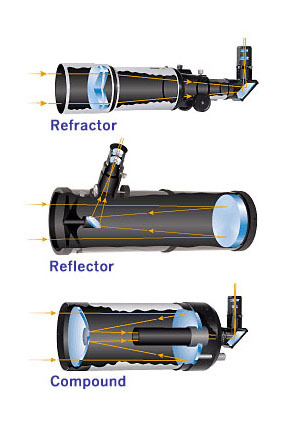 The reflector design allows for a larger telescope objective at an affordable price, while a refractor of the same size would increase the price dramatically. Many types of telescope mounts are available, including computerized models that track the movement of the sky. For visual use, a sturdy altazimuth or Dobsonian mount will make stargazing an enjoyable process. Telescopes that are not on a computerized mount shouldn’t move on their own or when adjusting focus. For astrophotography, an equatorial tracking mount is required. When properly polar aligned, the telescope will track objects in the night sky as the Earth turns. This will essentially “freeze” the object in space so a long exposure photograph can be captured. The number of telescope eyepieces available is staggering. They come in a wide variety of magnifications and fields of view. 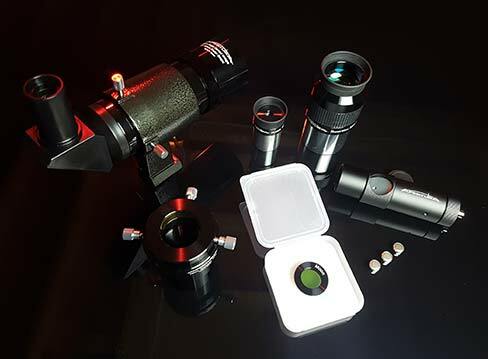 Having a set of telescope eyepieces that allow you to observe large swaths of the night sky, as well as high magnification views of planets, is ideal. A quality telescope eyepiece can last a lifetime if cared for properly. I would highly suggest a telescope that can be easily transported and set up in a reasonable amount of time. If the set-up process is a taxing ordeal, you are less likely to have the motivation to get outside and use it when the clouds finally part at 10 pm on a Saturday night. When the temperature drops in the winter, you’ll be even less motivated to carry a large, cumbersome telescope out into the backyard. For this reason, advanced amateur astronomers often build home observatories so that they can keep their large telescope set up at all times. If you have any health issues or cannot lift heavy objects, an extra large telescope and mount is out of the question. You are better off with something smaller and more portable. You will get much more use out of it. Which telescope offers the best value and experience? Based on my personal experiences, I can very comfortably suggest a Dobsonian Reflector. This was the first type of telescope I personally owned, and it totally knocked my socks off. This simple piece of equipment provided me with my first views of Jupiter, Saturn, the Orion Nebula and more. I still remember the summer I bought that first “dob”. I spent every clear night in the backyard studying the moon’s craters, the cloud bands of Jupiter, or trying to find Messier object. These were some of the most memorable astronomy nights in my life. If you decide to advance to an astrophotography telescope on a tracking mount down the road, you will still find plenty of uses for a visual performer like this in your inventory. The reason I have chosen the 8-inch model is that it has enough aperture to show more objects and detail in the night sky than smaller instruments. An 8-inch mirror is the “sweet spot” between aperture and portability. This telescope is large enough for jaw-dropping views, yet small enough to fit in your trunk or back seat. As I mentioned earlier, there are larger versions available as well if you handle the extra weight and size. The Apertura AD8 manages to stand out in a busy crowd of competing 8-inch Dobsonian reflectors. This is largely due to the quality of its construction, most notably the steel tension knobs to adjust the balance of the tube within the rocker box. The base of the Dobsonian mount includes an azimuth roller bearing system that provides dozens of support points. The result is a smooth, 360º motion that can be adjusted with a dedicated tension knob. Putting the Apertura AD8 together took me about 40 minutes, taking my time to carefully read the detailed instructions in the manual. The included accessories will likely be the tipping point for most consumers, as this 8-inch Dobsonian includes more useful tools than any of its competitors at this price. Coming from someone who’s unboxed a lot of telescopes over the years, I was extremely impressed with the generous extras that came with the AD8. The laser collimator, 2-inch 30mm eyepiece and 35mm extension tube were the biggest surprises. Dobsonian mounts make the telescope easy to point at the deep-sky object or planet of your choice. They are strong and sturdy so you can offer views through the eyepiece to family and friends without worry about them damaging your equipment. The manual control gives you a real sense of being “lost in space”, and makes “star-hopping” under a moonless sky an unforgettable experience. Through your observations sessions, you will begin to learn the constellations and the locations of some of the most impressive deep-sky treasures. A planetarium smartphone app such as Stellarium is a useful tool to help you locate objects with your telescope. I often use this digital star chart as a reference for the location of specific deep sky objects in my backyard. Put the Apertura AD8 to a head-to-head comparison with the telescope types listed below. If you interests include the biggest bang for your buck in terms of visual observing power, I think you will see why I recommend the AD8 at this price point. Some of these telescopes come as a bundle, which is a nice perk if you do not currently own any telescope equipment (such as eyepieces and filters). For a true comparison, all of the models listed below include the mount necessary to operate the telescope. 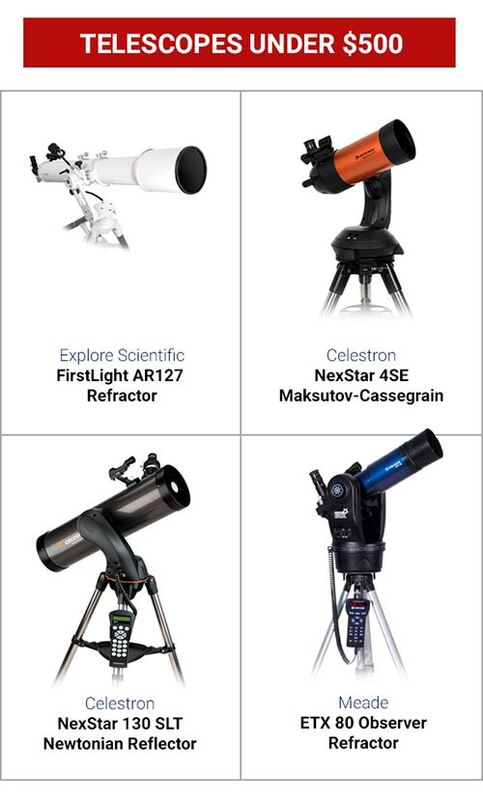 There is absolutely nothing wrong with any of these telescopes, in fact, they may fit your lifestyle better than a big Dob. Where all of these telescopes fall short, is the aperture. If big views are your ultimate goal, the Dobsonian always comes out on top. As I stated earlier, even if you’re plans include deep sky astrophotography down the road, I’d still recommend a Dobsonian telescope for beginners. This is the road I personally took, and the visual observations I made helped me not only learn the night sky, but appreciate it. It is possible to take pictures using a Dobsonian Telescope, using the eyepiece projection method. Large, bright objects like the moon and Jupiter offer the best chance at an impressive shot. You simply hold your point-and-shoot digital camera or smartphone up to the eyepiece manually. Even a total lunar eclipse can be captured through the eyepiece of a Dobsonian telescope if the camera settings are correct. Anything dimmer than this requires a tracking mount that can compensate for the rotation of the Earth. Deep sky astrophotography is an involved and challenging process. The budget can increase substantially when you start to incorporate cameras, filters, autoguiders and more. Have a look at my deep sky imaging setup for an idea of what’s involved.